Topkino is the place if you are a true lover of great movies (subtitled, original versions; films from all over the world), but can’t resist to have a beer or two after (or before) going to the movies. And if you’d rather have a solid meal in your stomach before watching some of the serious films, this is the right place as well. At Topkino you really find 3 in 1!! 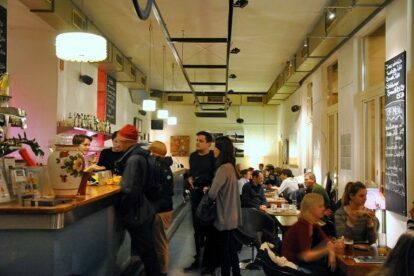 Topkino is situated in a nice old building and the bar is a long and spacious room with very high ceilings, packed with people on old sofas, chairs, at coffee tables etc. The showroom of the cinema is neither huge nor too comfortable, but they really show very special movies, you hardly see in any other cinema (though Vienna is a great place for movie connoisseurs) and of course also award winning movies from Filmfestival in Cannes or other smaller film festivals. So it is definitely worth checking out the programme before or after going to the bar.